- The effect is good for display miniatures because it will stay a little fragile. - It is not hard, it will stay flexible just like real spiderwebs. - it will be destroyed by too much wind and/or water. - like real spiderwebs these spiderwebs will connect between two points of your object. - spray after everything is painted, spraying before basecoating will destroy the webs. 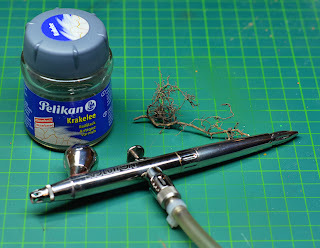 Now to get the effect just put a small amount of water in your airbrush FIRST and then add some of the Pelikan Antique Effect to your airbrush. 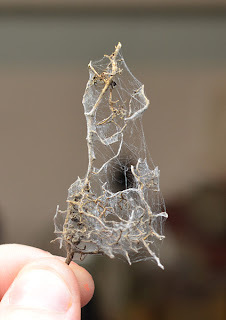 Too much water and no spiderwebs will be created and old spiderwebs will be destroyed. Too much PAE and you can't spray the mix with your airbrush. Now to spray the webs on your mini you have to spray with very very low pressure and large color amount. On a double action airbrush this means you have to pull your lever to the back and then press it down very gently. If you got the right mix and pressure your airbrush will make some special sound (almost whistling) and you will see spiderwebs appearing slowly. Don't spray with too much pressure or your webs will be just blown away. AFTER SPRAYING THIS EFFECT, CLEAN YOUR AIRBRUSH CAREFULLY. The PAE will really cog your airbrush badly if you don't clean it right away! If you want to support me in any way for sharing one of my long kept secrets you can buy the Liquid you need for this effect in my webshop that will launch officially tommorow! 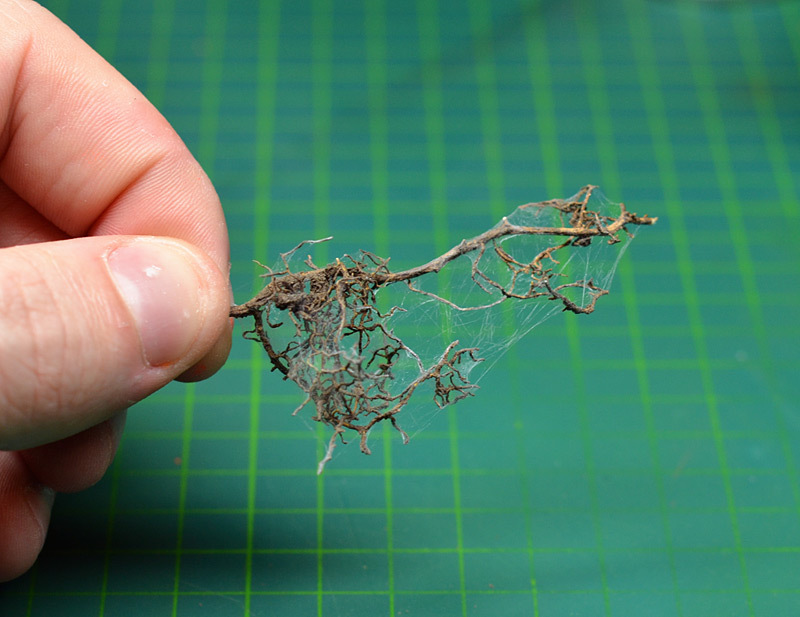 Hope you liked this tutorial and i hope to see spiderwebs on many miniatures in the future! You are really a Genius!!! looks wicked man, thanks..archived this. Thankyou for sharing Raffa, and best wishes for the launch of your new store! Damn, thats really fantastic,thanks for sharing this! Your new Shop is great, good luck with it and I hope there will be many products next time :) Mmmh I need an airbrush ... wich compressor do you use ? it's still an english blog so please write english. Finally the secret is revealed...yeah! this looks so realistic, unbelievable ! Thanks for sharing, I was waiting to know how they were done. Danke fürs Teilen Raffa, ich hoffe du bekommst etwas von der Community zurück. Manch anderer hätte den Trick vielleicht für ewig für sich behalten. (Auriga Publishing 2003)Keep on doing the good job. It´s realy phantastic. If I had known this technic....!!!. How much time I spent making my spider webs in this figure. Has anyone figured out how to make these more resilient? Maybe some PVA in the mix? How do you suggest cleaning your airbrush afterwards? Plenty of water to start with but is regular airbrush cleaner enough or do i need something a bit more aggressive? Could this be done with other cracle mediums? Like the one from Folkarts? I tried it with the cracle medium from Folkarts but either the airbrush clogged, at a low pressure nothing came out, at a higher pressure it was like a varnish? to be honest, I have absolutely no clue. Can be that it works, can be that you clog your airbrush. I heard that some heavy hairsprays work. The link for the product doesn't work. Does that mean you don't have the product to sell or the product no longer exists? If it exists where can I buy it? If it doesn't do you have another option? Thanks for your help..